Buddha and Beuys: despite their differences they both constitute the two most important cornerstones in the life and work of Babeth Mondini-VanLoo up to now. As a young art student she was immediately inspired by Beuys’ radically new view on art expressed in his notion of the ‘expanded concept of art’. After her studies at the art college in Aachen she joined him at the Art Academy in Düsseldorf, where she attended the ‘Beuys-class’ of 1971-1972 – until he was dismissed as a professor. Finally someone understood her public performances and her engagement for feminist artistic goals. Now she has found a teacher who believed in art as process and its influence on socio-political changes in life. For Beuys, the starting point of every creative act was chaos. Movement continues to move others, her teacher believed, the static doesn’t. Relieved, Babeth took it all in, as painting pictures for the living room, or creating marble sculptures for a garden or some public square was no longer part of this ‘expanded notion of art’. Now also actions, performances and discussions with people in or outside the art world, where-ever, were allowed, including the use of installations, photography and film and everyday objects. For Babeth, film and installations became the media of her choice. In Beuys’ class she felt totally at home, creatively and spiritually. Many of her works continued to respond to the work of her teacher, who was never tired of stating that “wherever I am is an academy”. Indeed, about five of her films and three re-edited versions show an exploration and response to Beuys’ lectures, installations and his philosophy; they are by no means just documentaries. Babeth answered him as an artist in her own right. Three examples will illustrate this. Firstly, in her film of 1976, which was an homage to him, she mainly used photo-montage. She showed it at Documenta 6 in 1977, where she took part in the discussions in Beuys’ Free International University space which was part of the project ‘Honigpumpe am Arbeitsplatz’ (Honey-pump at the workplace). Honey was pumped through a hose passing through many locations, as a metaphor for the creative blood-stream of the entire work process. During three weeks she stayed with Beuys and his crew overnight nextdoor in the Orangerie. Her second film apparently was dedicated to the setting up of Beuys’ large installation “Das Kapital – Raum 1970-1977” (The Capital – Room 1970-1977) at the Venice Biennale. At first the camera simply seems to follow the artist during the hanging of the school blackboards chalked with texts, diagrams and little motifs, showing how he measured them, fixed the texts, placed the tables, opened the grand piano, with a short appearance of Katharina Sieverding, and Heiner Bastian as assistant – until one notices the interpretation of the film-maker through her way of editing. We not only get to see the installation as a whole through the sum of the images, to which melancholy jazzy music is added, but we also are shown selected close-ups of text fragments on the blackboards, such as ‘natural resources’, ‘added value’, ‘revolution’ and ‘social’, and of forms of chalices and motifs of magnets. Every now and then something astounding emerges: since the black and white film images suddenly transform into white contour lines circling around Beuys and his blackboards, they reveal resemblance to the chalk drawings. There the film images light up as art within art. In creating this effect, the film-maker used a Bolex camera and opened the camera body slightly in between shots. The result is a process called solarisation. But this procedure is risky. It bears the danger of erasing the complete film. “That’s the gamble”, Babeth declares now, because in those days it was not possible to immediately inspect the images that were shot, as we can do nowadays. Also her third film – of 1980 – does not slavishly follow the three day conversation between Beuys and the Dutch artist Peter Struycken at the Museum Boymans-Van Beuningen Rotterdam. Beuys grasped the opportunity to lecture extensively –with Magda van Emde Boas seated next to him, who dutifully and meticulously translated all into Dutch. The title, ‘Invisible Sculpture’ was interpreted in a cinematic way. Beuys was talking predominantly about art as an expression of free creativity that is manifesting in a general way in human labour and all kinds of work-spheres. Art, according to him, is a spiritual notion that can be integrated with the notion of labour and production. And because these two are so closely related, this is precisely the meaning of the term ‘expanded notion of art’. In the meantime, while the camera follows Beuys drawing his diagrams on a blackboard, on the sound-track we already hear the explanation which he gave later, sitting at a table, to these drawings that originally were made in silence. Cinematically, time and Space were fit into each other. Now the end of the film became particularly significant: After Beuys’ statement that anthropological aesthetics means that creativity equals freedom; that creativity is ‘the real software’ and must be understood as social material that should be worked on continuously, before one’s birth and after death, his declaration culminated in the summary saying that this ‘software’ results in an understanding of the ‘invisible sculpture’. During these final statements there are no longer any images to be seen in the film, it remains dark. Her intimacy with Beuys’ work and philosophy, as demonstrated in this film, was so profound that she projected these film images on a cloud of steam after his death in 1986 as a memorial event in the Roxy theatre in Amsterdam, without having known his little cloud of steam in Basel in 1984. Through this way of projecting, the images evaporated and dissolved into space. Beuys remained one of the two focal points for Babeth, the other one came from Buddhism. She felt attracted towards one particular tradition called Dzogchen that promises its practitioners ‘self-liberation through training of the mind’. She found similar views there to those of Joseph Beuys, but also principles of a more comprehensive nature, like the illusory nature of our reality and the promise that only through constant training one can abandon dualistic thinking and action that dominate our prejudices and habits. Moreover, one of the leading Buddhist principles, that not only one’s own self counts, but the other in equal measure, is a principle that particularly inspired Babeth VanLoo. Her film work was soon extended to teaching activities in the field of art and later also to Buddhism. She succeeded in co-founding a Dutch Buddhist TV-network, BOS, and implemented her artistic and spiritual philosophy by programming for BOS, the “Boeddhistische Omroep.” Here, both her focal points, Buddha and Beuys, came together in a fruitful manner. It is therefore completely comprehensible that she saw her work as Programming Director for the Buddhist TV-station as ‘Social Sculpture’. Boeddha en Beuys: ondanks hun verschillen zijn zij steeds de twee grootste richtinggevers geweest in het leven en werken van Babeth VanLoo. Als jonge student aan de kunstacademie werd ze direct gegrepen door de volstrekt nieuwe kunstopvatting van het ‘verbrede kunstbegrip’ van Beuys. Na haar opleiding aan de Hogeschool voor de Kunst in Aken nam ze les bij hem aan de kunstacademie in Düsseldorf, waar ze deel uitmaakte van de zogenoemde Beuys-klas van 1971-1972 (tot aan zijn ontslag als hoogleraar). Hier was eindelijk iemand die haar toenmalige straatperformances begreep, en haar inspanningen voor feministische idealen. Eindelijk een leraar die geloofde in alles wat procesmatig was aan de kunst en de invloed daarvan op sociaal-politieke veranderingen in het leven. Voor Beuys was chaos het begin van ieder creatief proces. Wat bewogen wordt, blijft bewegen, in tegenstelling tot het statische, geloofde haar leraar. Dit te horen was voor Babeth een grote opluchting, want in dit verbrede kunstbegrip ging het niet meer om het maken van een schilderij voor de woonkamer, een marmeren beeld voor in de tuin of op een plein, maar veeleer om acties (waar dan ook) en gesprekken met kunstkenners en leken, waarbij alle middelen waren toegestaan, inclusief installaties, alledaagse voorwerpen en media zoals film en fotografie. Babeths media waren film en installaties. In zijn omgeving voelde ze zich thuis, zowel spiritueel als creatief. Inderdaad zien we in ongeveer vijf films, en drie latere hermontages, een aanschouwelijke dialoog met de voordrachten, installaties en overtuigingen van Beuys; deze films zijn geenszins zuiver documentair. Babeth antwoordde hem als kunstenaar, niet als filmmaker. Drie voorbeelden kunnen dit verduidelijken. 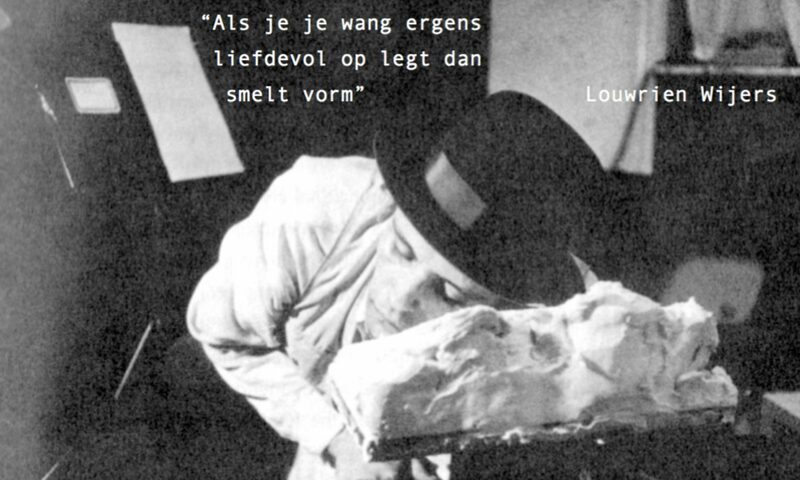 Om te beginnen maakte ze in 1976 bij het maken van haar eerste film als hommage aan Beuys vooral gebruik van fotomontages. Ze vertoonde de film in 1977 tijdens Documenta 6 in Kassel, waar ze gedurende drie weken deelnam aan de discussies die Beuys hield in de FIU-kamer als onderdeel van het project Honigpumpe am Arbeitsplatz (Honingpomp op het werk). Ze overnachtte daarbij in de Orangerie, waar ook de leiding uitkwam waardoor honing werd gepompt, als metafoor voor de bloedstroom van het gezamenlijke arbeidsproces. Haar tweede film lijkt in eerste instantie louter verslaglegging te zijn van het opbouwen van Beuys’ grote installatie Das Kapital Raum 1970-1977 op de Biënnale van Venetië. Aanvankelijk lijkt de camera slechts de kunstenaar te volgen bij het ophangen van met krijt beschreven schoolborden. Hij meet de opschriften uit en maakt ze definitief, hij verschuift tafels en klapt de vleugelpiano open, waarbij heel kort Katharina Sieverding verschijnt en Heiner Bastian helpt. Maar dan wordt in de wijze van monteren de interpretatie van de filmmaker duidelijk. De som van de beelden en de jazzy, melancholische muziek geeft niet alleen inzicht in de installatie, maar bevat ook subtiel ingelaste detailopnames van de teksten op de schoolborden, zoals ‘bodemschatten’, ‘meerwaarde ‘revolutie’ en ‘sociaal’, en beelden van kelk-vormen en magneet-motieven. Af en toe gebeurt er iets verbazingwekkends: de zwartwit beelden veranderen plotseling in witte contouren rond de figuur van Beuys en de schoolborden, zodat de filmbeelden er net zo uitzien als de krijttekeningen. De filmbeelden lichten op als kunst in de kunst. Om dit effect te bereiken heeft de filmmaker gebruik gemaakt van een Bolex-camera, die het mogelijk maakt tussen opnames door de camera te openen. Als gevolg daarvan worden de beelden gesolariseerd. Een gevaarlijke werkwijze, want de plotselinge lichtinval kan alle opnames wissen. ‘Dat was de gok’, zegt Babeth nu, want in die tijd was het nog niet mogelijk de beelden te controleren tijdens de opname zoals dat nu het geval is. Ook haar derde film, uit 1980, is meer dan een documentatie van het drie dagen durende gesprek tussen Beuys en de Nederlandse kunstenaar Peter Struycken in Museum Boijmans Van Beuningen in Rotterdam. Beuys nam uitvoerig de tijd voor zijn eigen voordrachten, terwijl Magda van Emde Boas naast hem zat en alles onvermoeibaar en bewonderenswaardig correct in het Nederlands vertaalde. De film is een cinematografische interpretatie van de titel, Onzichtbare sculptuur. Beuys sprak destijds voornamelijk over kunst als uitdrukking van vrije scheppingskracht, die van toepassing is op alle menselijke arbeid en op alle mogelijke terreinen. Kunst, zei Beuys, was een geest = begrip dat kon worden geïntegreerd in het begrip arbeid/productiviteit. Deze verbondenheid is precies wat hij bedoelde met de term ‘verbreed kunstbegrip’. Ondertussen volgt de camera Beuys bij het tekenen van zijn diagrammen op een schoolbord. Hij doet dit zwijgend, maar in de film klinkt reeds de toelichting die hij later aan tafel gezeten uitsprak. Zo worden in de film tijd en ruimte in elkaar geschoven. De manier waarop de film eindigt, is van grote betekenis: na de uitspraak van Beuys dat antropologische esthetiek inhoudt dat creativiteit moet worden opgevat als vrijheid, die als ‘in feite een soort software’ en als sociaal materiaal moet worden gezien, materiaal dat voor de geboorte en na de dood van het mens ‘verder bewerkt’ moet worden, mondt zijn uiteenzetting ten slotte uit in de samenvatting dat die software leidt tot het begrip van de ‘Onzichtbare Sculptuur’. Terwijl deze woorden klinken zijn er al geen filmbeelden meer te zien. Het scherm blijft donker. Dat Babeth een intieme verbondenheid had met het werk en de filosofie van Beuys blijkt al uit deze beelden, maar nog meer uit wat plaatsvond na zijn dood in 1986. Tijdens een herdenking in het Roxy Theater in Amsterdam projecteerde ze deze filmbeelden op rookwolken, hoewel ze op dat moment nog niet bekend was met zijn kleine stoomwolkje in Basel in 1984. Door deze manier van projecteren verdampten de beelden en losten ze op in de ruimte. Beuys is steeds een van de twee grootheden gebleven die Babeth richting hebben gegeven, de andere was het Boeddhisme. Ze voelde zich daarbij speciaal aangetrokken tot een bepaalde stroming in het Boeddhisme, de zogenaamde Dzogchen, die zijn beoefenaars en gelovigen vooral ‘zelfbevrijding door geestelijke oefening’ belooft. Hierin vond ze overtuigingen die aansloten bij de leer van Beuys, maar ook principes die nog verder gingen, zoals de opvatting dat alles denkbeeldig is en dat men slechts door onophoudelijk oefenen in staat zal zijn los te komen van denken en handelen dat bepaald word door gewoontes en vooroordelen die voortkomen uit een dualistisch wereldbeeld. Dat bovendien niet alleen het eigen zelf van belang is maar ook altijd dat van de ander, is een boeddhistische grondregel waarvan Babeth VanLoo sterk doordrongen is. Naast haar werk als filmmaker ging ze ook al snel lesgeven op het gebied van de kunst, en richtte zich op het Boeddhisme. Ze slaagde erin om in het sterk maatschappelijk verzuilde Nederlandse televisielandschap de Boeddhistische Omroep mee op te richten en daar haar artistieke en spirituele opvattingen uit te dragen. Zo kwamen haar beide inspiratiebronnen, Beuys en Boeddha, optimaal tot hun recht. Deze radio- en televisieomroep heeft bestaan tot aan 2016, en het mag als vanzelf spreken dat Babeth de inspanningen van de omroep voor het Boeddhisme tot aan het eind heeft opgevat als ‘Sociale Sculptuur’. Buddha und Beuys: Trotz ihrer Ungleichheit bildeten beide die wichtigsten Vektoren für das bisherige Leben und Werk von Babeth Mondini-VanLoo. Zunächst war sie als junge Kunststudentin begeistert von der nie zuvor gehörten Kunstauffassung seines ‚erweiterten Kunstbegriffs’. Nach ihr Studium an einer Kunsthochschule in Aachen folgte sie ihm an die Düsseldorfer Kunstakademie in die sog. Beuys-Klasse von 1971-1972 (bis zu seiner Entlassung als Professor). Hier hatte endlich jemand Verständnis für ihre damaligen Strassen-Performances und ihren Einsatz für feministische Ziele, da ihr Lehrer nun einmal an alles Prozesshafte in der Kunst und deren Wirkung auf sozial-politische Änderungen des Lebens glaubte. Ausgangspunkt für jede Kreation war nach Beuys’ Auffassung immer das Chaos. Das Bewegte bewegt auch weiterhin, nicht das Statische, glaubte ihr Lehrer. Babeth hörte es erleichtert, denn Bilder zu malen für das Wohnzimmer, Marmorskulpturen für Gärten und Plätze lag nicht mehr im Sinne dieses erweiterten Kunstbegriffes, eher Aktionen – wo auch immer – und Gespräche mit Kunstkundigen und Unkundigen, wobei der Einsatz von Installationen, Alltagsgegenständen und Medien wie Fotografie und Film erlaubt wurde. Für Babeth wurden es die Medien Film und Installationen. In dieser Klasse fühlte sie sich spirituell und kreativ zu Hause. Zunächst arbeitete sie 1976 bei ihrem ersten Film als Hommage an ihm vor allem mit Fotomontagen und zeigte ihn auf der documenta 6 1977 in Kassel, wo sie drei Wochen lang an Beuys’ Diskussionen im FIU-Raum „Honigpumpe am Arbeitsplatz“ teilnahm. Sie übernachtete damals stets in der Orangerie, wohin der Honig als Metapher für den Blutstrom des gesamten Arbeitsprozesses durch einen Schlauch hinübergepumpt wurde. Ihr zweiter Film scheint zunächst dem Aufbau von Beuys’ grosser Installation „Das Kapital Raum 1970-1977’ auf der Biennale in Venedig gewidmet. Die Kamera scheint dem Künstler zunächst beim Hängen seiner mit Kreide beschrifteten Schultafeln zu folgen, – beim Ausmessen der Schrift und ihrer Fixierung, beim Verschieben der Tafeln, beim Hochklappen des Flügeldeckels, wobei Katharina Sieverding und später Heiner Bastian halfen, – bis man anhand der Bildmontage Interpretationen der Filmerin wahrnimmt. Nicht nur Einsichten in die Installation ergibt die Summe der Bilder, die jazzyhaft mit melancholischen klingenden Musik unterlegt wurden, sondern auch eingeschleuste Detailaufnahmen sprachlicher Inhalte auf den Schultafeln wie ’Bodenschätze“, „Mehrwert“, „Revolution“ und „social“ sowie Kelchformen und Magnet-Motive. Ab und zu ergibt sich Erstaunliches: Da die schwarz/weiss-Aufnahmen auf einmal in weisse Konturen um die Figur von Beuys und die Schultafeln wechseln, gleichen sich die Filmbilder den Kreidezeichnungen an. Auch die Filmbilder scheinen auf als Kunst in der Kunst. Zum Zwecke solcher speziellen Effekte machte die Filmerin erstmals Gebrauch von einer Bolex-Kamera, die es erlaubt, dass man zwischen den Aufnahmen das Gehäuse öffnen kann. Im Ergebnis wurden die Filmbilder solarisiert. An sich barg die Methode Gefahr für alle Aufnahmen. Der plötzliche Lichteinfall könnte alles löschen. „That’s the gamble!“, erklärt Babeth heute, denn damals konnte man noch an keiner Kamera Aufnahmen kontrollieren wie gegenwärtig. Auch ihr dritter Film von 1980 folgt nicht dokumentierend den dreitägigen Gesprächen zwischen Beuys und dem niederländischen Künstler Peter Struycken im Museum Boymans-van Beuningen in Rotterdam, wobei Beuys weitgehend die Zeit mit eigenen Vorträgen füllte und Magda van Emde-Boas neben ihm sitzend alle Ausführungen beharrlich und bewunderungswürdig korrekt ins Niederländische übersetzte. Der Titel „Unsichtbare Skulptur“ wurde filmisch interpretiert. Beuys sprach damals vor allem von der Kunst als Ausdruck freier Schöpferkraft, die sich ganz allgemein auf die menschliche Arbeit und auf alle möglichen Arbeitsfelder bezöge. Kunst sei ein Geist=Begriff, der sich mit dem Begriff von Arbeit/Produktion integrieren liesse. Da beide zusammen gehören, sei dies der Inbegriff des ‚erweiterten Kunstbegriffes.’ Inzwischen folgt die Kamera Beuys beim Zeichnen seiner Diagramme auf einer Schultafel und unterlegt bereits diese an sich still ausgeführte Handlung mit seinen später am Tisch gemachten Erläuterungen. Zeit und Raum wurden so filmisch ineinandergeschoben. Bedeutsam wurde nun das filmische Ende: Nachdem Beuys erklärte, die anthropologische Ästhetik bedeute, dass Kreativität als Freiheit aufzufassen sei, die als ‚wirkliche software’ und als soziales Material zu verstehen sei, das vor der Geburt und nach dem Tode des Menschen ‚weiterbearbeitet’ werden müsse, gipfelte die Aussage in der Zusammenfassung, diese software ergäbe einen Begriff von der ‚Unsichtbaren Skulptur’. Während dieser Ausführungen zeigt der Film bereits keine Bilder mehr, es bleibt dunkel. Beuys blieb einer der beiden Arbeitsvektoren für Babeth, der andere erwuchs ihr aus dem Buddhismus. Sie fühlte sich dabei von einem bestimmten Zweig angezogen, dem sog. Dzogchen, der dem Probanden und Gläubigen vor allem „Selbstbefreiung durch Geistestraining“ verspricht. Hier fand sie verwandte Überzeugungen zur Lehre von Beuys, aber auch weitergehende Prinzipien wie die, alles sei illusionär und nur durch ständiges Training komme man dazu, sich von einem Denken und Handeln in dualistisch geprägten Gewohnheiten und Vorurteilen verabschieden zu können. Dass darüberhinaus nicht nur das eigene Selbst zählt, sondern immer auch der Andere gleich mit, ist ein buddhistischer Grundsatz, der sich Babeth VanLoo stark einprägte. Ihre filmisch Arbeit wurde bald ergänzt von Lehrtätigkeiten zu künstlerischen und bald auch buddhistischen Inhalten. Es gelang ihr im niederländischen Fernsehen, das nach den Interessen gesellschaftlich verankerten Vereinen strukturiert ist, den „Boeddhistische Omroep“ mit zu gründen und hier ihre künstlerischen und spirituellen Überzeugungen über das Programm auszutragen. Hier wirkten für sie beide Vektoren Buddha und Beuys optimal. Und es ist verständlich, dass sie bis zur Schliessung dieser Fernseh- und Rundfunksparte in 2016 ihre Gesamtarbeit für den Buddhismus auch als ‚Soziale Skulptur’ begriff.